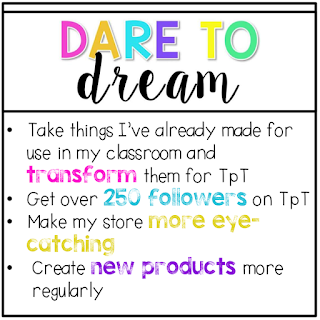 Taking part in the TpT Sellers' Challenge has been very eye-opening for me. For starters...I've got a LONG way to go in the world of TpT. But you know what? I'm super excited! I have already learned so much in the past two weeks that I am more confident than ever that I can definitely do this and do it well! 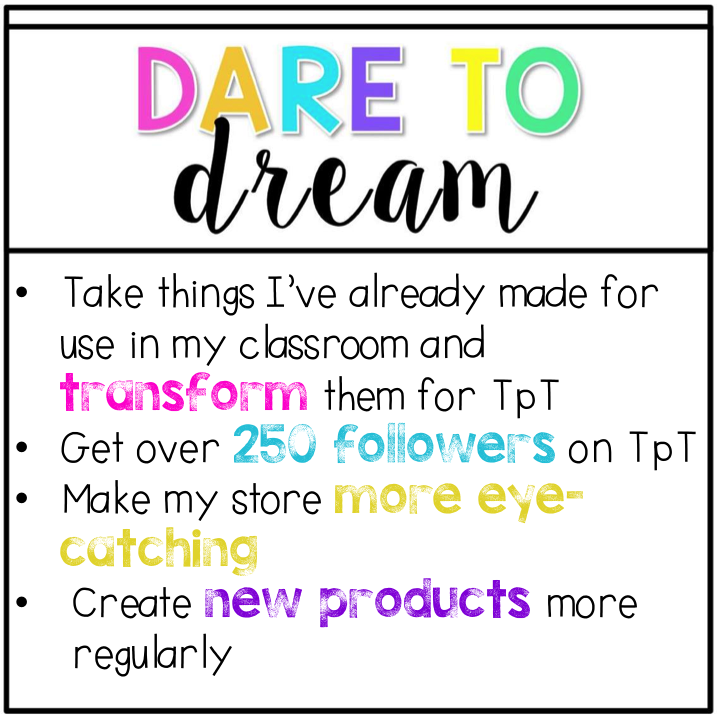 So, in honor of this week's challenge, Dare to Dream, I wanted to share some of my dreams for my TpT store in the upcoming months. #1 I've made SO MUCH STUFF to use in my own room. I specialized in Science and Social Studies for the past two years, and we had no curriculum. So, everything I used I either found online or just made myself. And honestly, sometimes it was easier to just make it myself because then I knew it specifically met my class' needs. It might take some tweaking, but I could definitely turn lots of those creations into future products in my TpT store. #2 I started the challenge with 26 followers on my TpT store. I updated one product as part of week one's challenge, blogged about it, and then hyped it up on my Facebook page, offering it as a freebie for anyone who followed my TpT store by the next day. It got me up to 66 followers, which I was ecstatic about! If I continue to update and add new products, I think 250 followers is totally doable. #3 This is on the agenda for this week! I plan on making a banner for my store, and reread how to hack that quote box! I'll be honest, I do like the stores that have fancy pages. I even included a screenshot, so you guys can hold me accountable to this commitment to change and help me celebrate the difference soon!!! 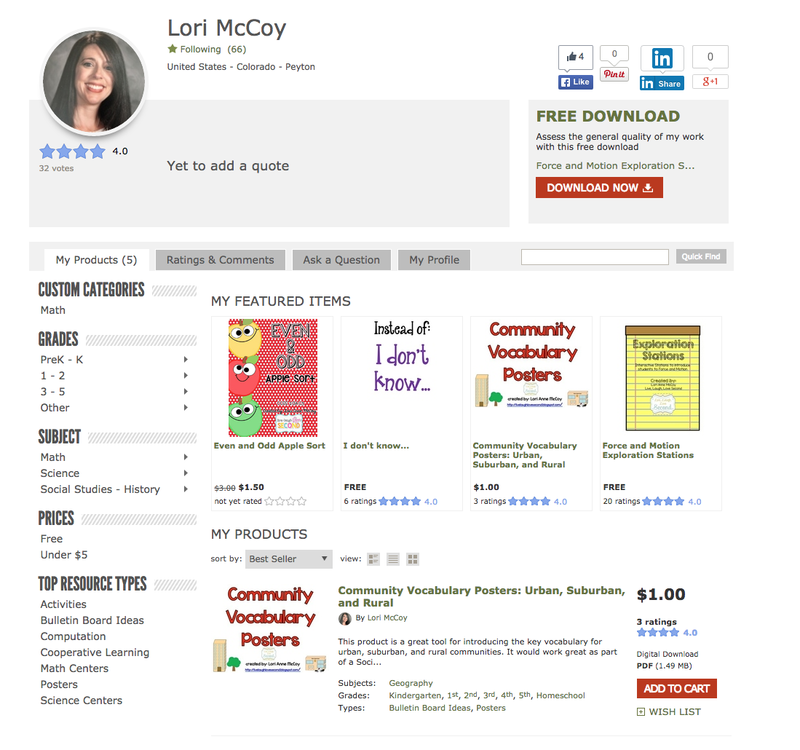 #4 I'm moving to a new school in a new district this year, where I will be using different curriculum including CKLA. I'm looking forward to making some new products to accompany it, but I'm really looking forward to establishing some new things in my classroom, like morning work, newsletters, and even some specific homework that will include a lot of reading practice. This should enable me to create new products regularly for TpT! I'm really looking forward to this week's challenge, and I'm hoping this summer cold that's kept me in bed all day today will be gone soon! Have a great week! It was neat to read through your dreams! May they all come true!